Ideally located, this newly built one bedroom/one bathroom cottage has a full kitchen with dishwasher and gas stove, brick patio facing a lovely garden, laundry, central air, and a generous yard. Walk to Sag Harbor village for drinks at the American Hotel, or shop at local farmer's markets. Walk down to Main Street and browse the town's famous antiques stores, or take a sunset sail to Shelter Island from the marina. Pilates, FlyWheel, Yoga, Gym with weights, cycling. New Yorker who has been coming to Sag Harbor for two decades. Ever wanted to discover the Hamptons but don't want to spend your time stuck in traffic? Sag Harbor is a unique town with great restaurants and shopping and boating. This house is right in the historic village, just three blocks from town. The house is brand new, but the property has been in the same family for generations. We have always loved Sag Harbor for its small town feeling with a dash of sophistication. There's so much to do, and you can walk or bike anywhere--the picturesque American small town by the sea. Residents of Sag Harbor include writers, artists, and families who have lived here for generations. Literary Trivia: Before we rebuilt this house it was used as an office by the writer and Sag Harbor resident E.L. Doctorow, who wrote part of 'Billy Bathgate' here. The carriage house is newly built, ideally located and with high end amenities like full kitchen, laundry, and central air. Cuisinart, coffee machine, toaster, bbq outside on patio. Kitchen has dishwasher, dual fuel stove, all appliances new. Stools and work table in kitchen area, full six seat table and chairs outside on patio. Table and six chairs on the patio for outdoor dining. Also, fold up beach chairs and two butterfly chairs for lounging in the garden. Walk to public courts four blocks away. Steps from downtown Sag Harbor, great location and excellent accommodations for a getaway weekend or a week in this great little village. Excellent. Charming. Perfectly located in town. It's a small house, but totally comfortable and it has everything. It is a quick 5-minute stroll to the heart of Sag Harbor. Most enticing of all, is the serene backyard, with lounges and an outdoor table that seats six for meals. Stayed two months and loved it! A lovely home with beautiful outside sitting arrangements, only few hundred yards to the center of Sag Harbor. We thoroughly enjoyed our stay at this very charming carriage house. It looked just as the photos depicted, was very comfortable and an ideal location! We would love to return again!!! We loved our stay in this cute and cozy cottage. It was very clean and and spacious enough for two! The area is beautiful and we loved the walking convenience to the center. The restaurants and shops are top-rated. 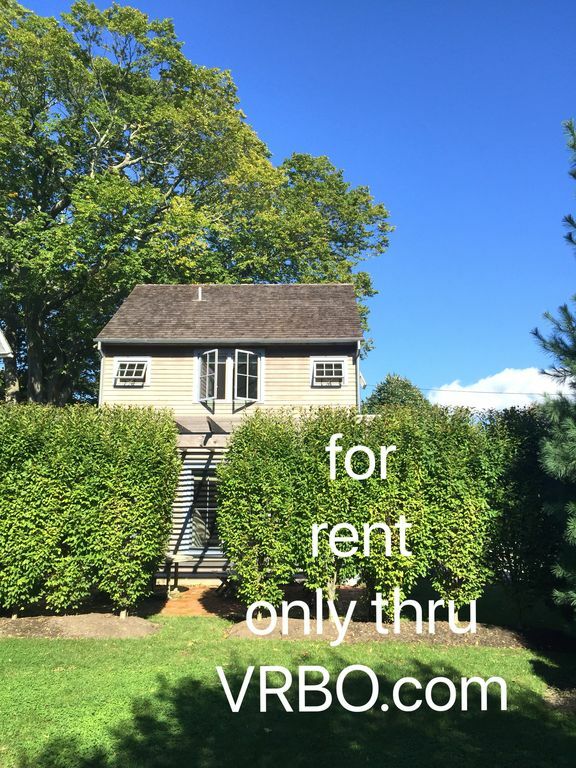 Charming one bedroom that is so close to town and all Sag Harbor has to offer! My Boyfriend and I stayed at this amazing house for a wedding we had in Bridge Hampton (about a 12 min ride). Everything was perfect and clean with lot's of towels and anything you could need for cooking. There is also a washer and dryer and the cutest outside area for dining. I wish we stayed longer. Highly recommend for a couple looking for a cute house in Sag!